Get instant results to assess your leadership. The first objective in our leadership development coaching and training materials is to “know yourself”. Before the act of executing decisions in leadership and leading others, the foundational step in leadership is knowing who you are–your unique mix of talent that allows you to balance results vs. relationships, communicate well with others, and more–abilities that position you for fulfillment and success in life and work. To better understand the value of this assessment, take our FREE, insightful profile that helps you pinpoint your natural strengths and struggles in leadership. Take 10 minutes to assess where you are, and then determine if Leadership Behavior DNA would be an ideal tool for individual and team development. This FREE, one-page report gives you a broad snapshot about your individual leadership style on getting results, developing relationships, and your communication style as a leader. Please note: this report is very limited in scope and is provided for individual/personal awareness and development. This sample is not suitable as a hiring, managing, or any other HR-related function by an organization. *This profile is provided by Leadership Behavior DNA™ and DNA Behavior®. Please note that Leading with Honor or DNA Behavior does not sell or distribute personal contact information to any third-party organization. Your personal information is safe with us. 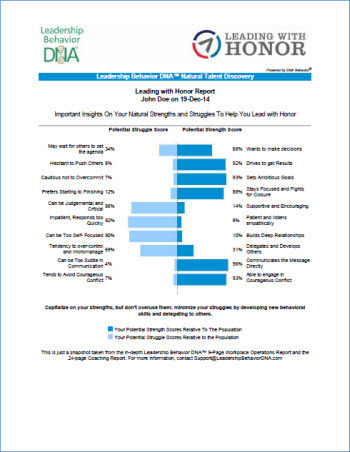 By taking this assessment, you will also receive additional information about other resources available from Lee Ellis and Leadership Behavior DNA.